Atlanta Area Information - McCreary Realty Management, Inc. Relocations to the NW Metro Atlanta market are never easy. Here you will find all manner of information about living in and around Marietta, Smyrna, Kennesaw, Acworth, Woodstock within Cobb and Cherokee Counties. We love our area! We’ve chosen to live here and hope you will too. Our area doesn’t lack for things to do and fun to be had. We have great schools with a proven record of test scores above the national averages nationwide. We have the third largest university in the state in Kennesaw State University. We have every manner of services and shopping to cover just about every need known. We have great recreation in Six Flags over Georgia and White Water among others. We have great parkland with Kennesaw Mountain National Battlefield Park, Chattahoochee River Nature Park among others in our cities and counties. Through our excellent roads, we have three major interstates that afford you easy 3-5 hours drives for weekend jaunts to the North Georgia Mountains or Georgia Coast. Our area has a lot to offer. It is a great place to settle down and to pull up a rocking chair on the front porch and stay awhile. 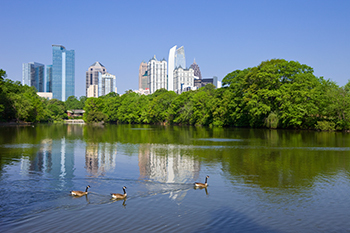 Being so close to Atlanta brings a whole host of activities to fit almost every possible interest! From Professional Sports to College Sports to Attractions to Restaurants, Shopping, the Symphony, Museums, Opera, Theaters and Concerts. Below you will find lists of likely services, governments, schools, transportation, tourism, parks and healthcare that you will need while living in the NW Metro Atlanta Area. Major Highways I-75, I-575, I-285, US 41 (Cobb Parkway), Barrett Parkway, East-West Connector, South Cobb Drive, Atlanta Road, Roswell Street/Road, Dallas Highway Click HERE for our local maps.